If you’re wondering what St. John’s is all about or how you can become more connected with your neighbors, this is a great place to start. 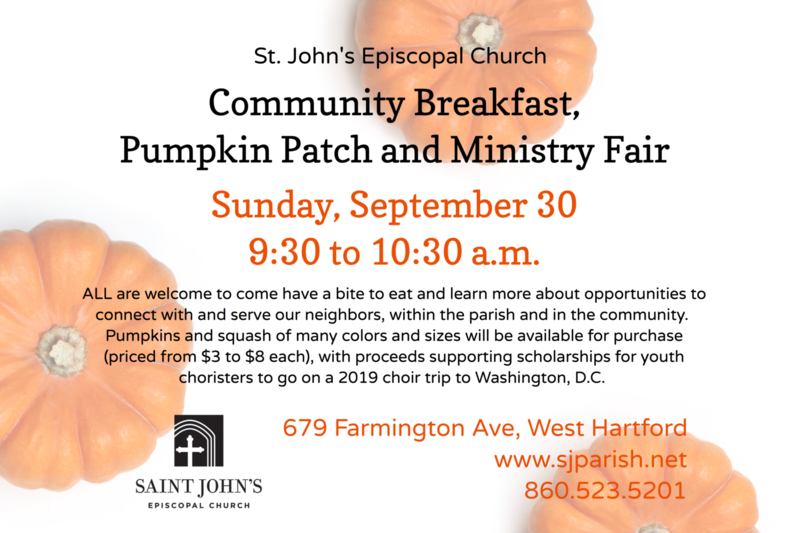 Join us at 9:30 a.m. on Sunday, September 30, to learn more about St. John’s many diverse ministries. Leaders and participants in parish groups—ranging from ushers, altar guild, acolytes and choir to our healing ministry, community outreach, Bible studies and fellowship groups—will be on hand to share stories, answer questions and discuss how you can be involved. Breakfast and coffee will be provided! This event will also include our first-ever St. John’s Pumpkin Patch. Thanks to a generous donation from a choir member who has a family farm, we’ll have pumpkins and squash of many sizes and colors available for sale ($3 to $8 each). This is a great time to pick up what you need for fall decor and jack-o-lantern carving. Proceeds from pumpkin sales will go toward youth chorister scholarships for a planned trip to Washington, DC, in the summer of 2019.